It’s the newest gang hitting the streets of south-east Queensland, but fortunately its members are harmless. SLOBs (Silly Lutherans On Bikes) caused more amusement than fear among delegates and visitors, and a brazen daylight attempt to kidnap Marty was quickly foiled. 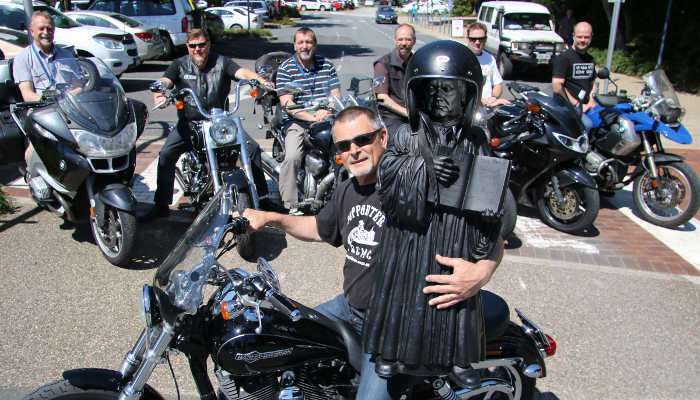 Seven delegates travelled on two wheels to Convention—front of photo, with Marty: Pastor Geoff Havelberg; back (left to right), Dieter Melzer and pastors David Kuss (also inset), Detlev Vosergau, Julian Bayha, visitor Dion Bentham and Pastor Eugene Minge. 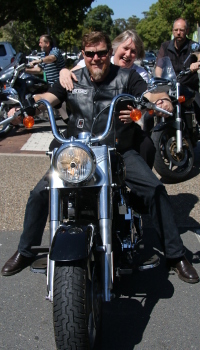 Not to be upstaged by Marty, The Lutheran editor Rosie Schefe got her ride around the carpark (which explains the ‘no helmets’; please don’t write in) on Pastor David Kuss’ Harley.